I'm sure by the time this posts you have all been made fully-aware of the full line-up for FunFunFun Fest 2011. However, perhaps those other blogs and twitter-feeds didn't have videos from the artists included? First off, let's review who we already know is playing, then I'll have all the rest below the break. 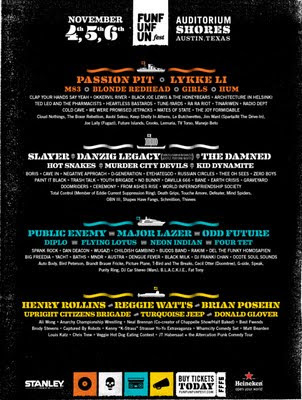 There you have it kiddos, the line-up for the first EVER FunFunFun Fest at Auditorium Shores. Are you as excited as I am?